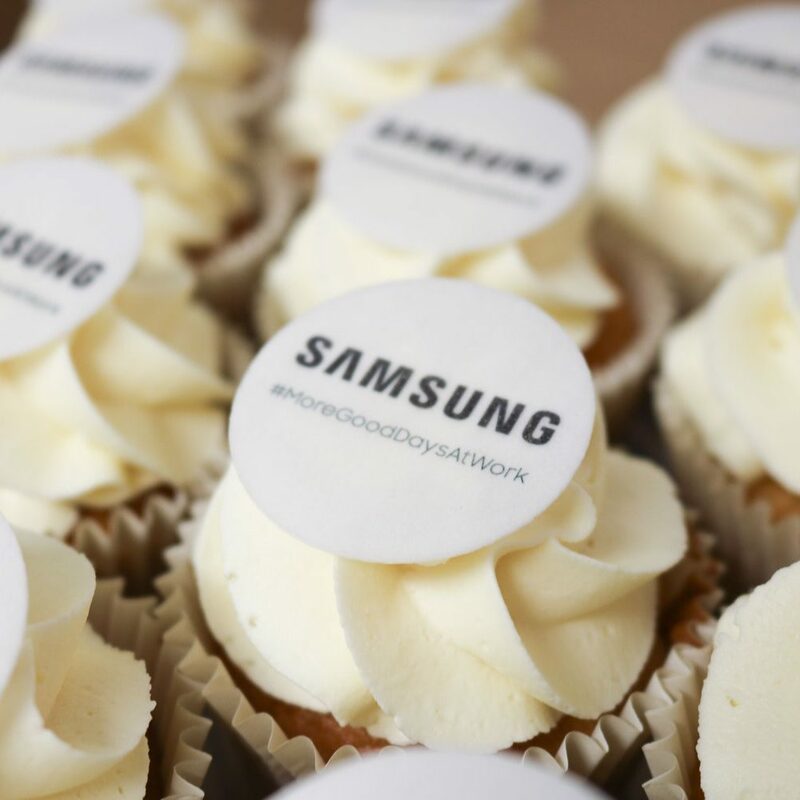 Create your own branded cupcakes, so you can stand out in the crowd. Also, we are rated number one for corporate cupcakes in London, so you know they taste good. We’ve made over 1,000,000 cupcakes. We respond in 10 minutes. To book your order in less time. We only need 24 hours notice. Our standard packages can be ordered online. Our state of the art kitchen, can produce thousands of cupcakes a day. So whether you need 100 or 10,000 cupcakes, we produce them all fresh to order. The original cupcake, perfect for large parties. Our new favourite served with white icing. 1000 branded brownies, 5 cm diameter. At your door, ready for you to enjoy, in 3 easy steps. Add your date below. A 7-day notice is required for all brownies. Upload your logo at the checkout. Add your delivery address and order online. Enjoy our famous corporate cupcakes delivered straight to your door, with our online ordering system. We make all 1,000 cupcakes fresh in our bakery, before piping them with white buttercream, adding your logo and sending them to you to enjoy. Your cupcakes delivered to your door, ready for you to enjoy, in 4 easy steps. Add the branded cupcakes to your basket and head to the checkout. Add your date into the date field at the checkout. A 7-day notice is required for all cupcakes. Need them sooner? We can do orders with 24 hours notice. Please email [email protected] to find out more about our branded cupcakes. Enjoy our famous corporate Madeleines delivered straight to your door, with our online ordering system. Free delivery anywhere in the UK. Delivery made by us. Your branded Madeleines delivered to your door, ready for you to enjoy, in 4 easy steps. Add the branded Madeleines to your basket and head to the checkout. We’ve introduced a new way to order our branded cupcakes. It’s really easy within a few clicks to get your cupcakes ordered and on their way to you. Add your date below. A 7-day notice is required for all products. Our custom orders are perfect when you need something special. From corporate cupcakes that are colour matched, or a doughnut wall for your wedding, so we can create anything you wish. Get in contact or fill in the form below to get a custom quote. From 100 personalised doughnuts to 10,000 corporate cupcakes, we can produce almost anything in our wholesale bakery. Got something different in mind, let us know. Choose the date you need your cakes by and we'll get them hand-delivered. We only need 24 hours notice. By filling in this form I consent for Amore Bakery to contact me about my order. Cupcakes are a brilliant way to promote your business, so you can stand out from the crowd. All our cupcakes are hand-delivered, so they arrive fresh and in perfect condition. From product launches to business promotions, we aim at creating unique printed cupcakes. They’re also decorated with your brand logo or company message. Finally, we’ve had the pleasure and honour of working with a multitude of renowned companies and brands. Including BMW, Philips, McCafee, Microsoft, Lindt chocolates, Britvic, Cake Masters magazine and many more. Amore Bakery is the largest supplier of branded cupcakes in London. Our bakery is based just outside of London, so all of our cupcakes can be hand-delivered all around the UK. We love making branded cupcakes and personalised doughnuts for all kinds of occasions. Finally, we are also rated number one for cupcakes in London, so you know they’ll taste as good as they look.